Imagine, just for a second sharing your most intimate moments with the world. Not THOSE intimate moments, the ones that are more common and are generally less sweaty. Sheika Lugtu shares these more common moments on a frequent basis at OMGcow.com. It’s a comic diary where she pours her heart into smart, heart-wrenching writing and wonderful, intelligent, and beautiful art. Lugtu is telling the world what it means to be her: a complicated, sweet, punky, and thoughtful student of art trying to create her way through a sometimes difficult and often incredible world. Lugtu’s writing is self-examining and relatively un-filtered. She talks about moments in her life that were probably very stressful and the creation of her comic pages were more than likely cathartic. At the same time, she often talks about very joyful moments that she was certainly very proud to share with the world. Lugtu’s writing of these moments if often simple and exquisite, poetic. Lugtu’s writing is never frivolous, no matter what the particulars of her day were. Lugtu’s art is just as complicated as her writing. Sometimes her art is deceptively comical like a series of Peanuts panels and other times, it reflects the fines arts that Lugtu has studies. All within the same page, Lugtu often includes a mix of strokes and line thickness to convey different moods, emotions, levels of intelligence and complexity. 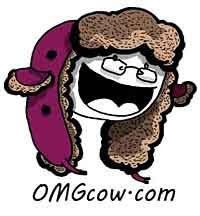 OMGcow.com is a peak into Lugtu’s personal story that only she can tell with such verve and smarts. When you see Lugtu at a show in the Los Angeles or Chicago areas, tell her BuyIndieComics.com sent you. She’ll laugh and smile and sell you one heck of a personal comic diary. This entry was posted in Columns and tagged alternative comics, Comic Diary, comikaze, indie comics, OMGcow, Sheika Lugtu. Bookmark the permalink. Follow any comments here with the RSS feed for this post. Post a comment or leave a trackback: Trackback URL.